When you find an awesome deal like this one-shoulder ruffle dress for under $30, you have to share it with friends! Whether you’re looking for the perfect wedding guest outfit or a dreamy date night dress, this dress is it! This dress drew my eye because of the statement ruffles, butI also loved the blue and white striped fabric. It’s flirty and has movement, plus the fabric is super lightweight and breathable, making it a must-have for summer. And the best part is it’s only $28! I knew I wanted to pattern mix and pair this dress with my Breezy Babe clutch from my friend Sarah’s Etsy shop (you can save $5 off of it right now with code FIREWORK). I love the neon colors, but it also picks up the blue of my dress. To tie my clutch in, I added my favorite pink heels and neon yellow earrings that are under $15. I could see wearing this dress out to dinner or to a wedding, but you could also dress it down with sandals for a girls day. I had planned wearing this while we were at the beach, but it rained almost every night. Where would you wear this dress to? I love that with the pink shoes! Thanks! I’ve gotten so much wear out of these shoes! Thanks, Jaymie! I’m obsessed with ruffles this year! 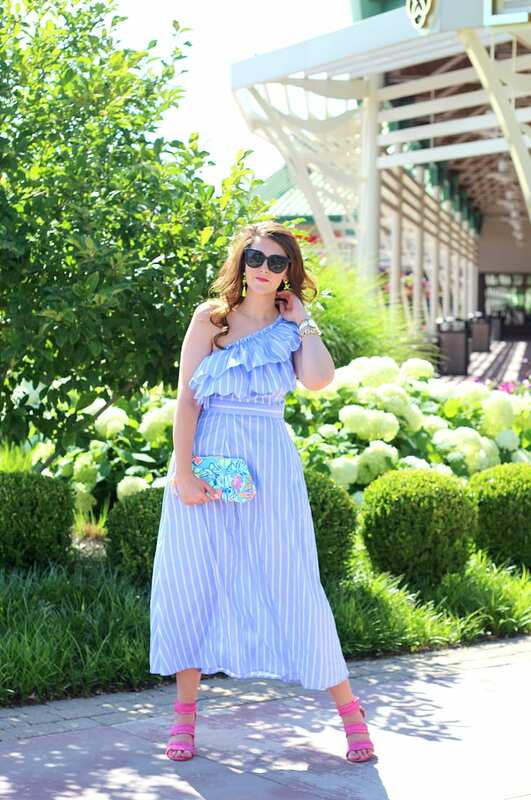 The double layer ruffle is so pretty and I love anything with stripes! This dress is gorgeous, and you can’t beat the price tag!! Love how you accessorized it with bright colors. Your earrings are so pretty. Beautiful look! Thanks so much, Elise!!! I’m a big fan of neons, and they seemed to go well. I couldn’t believe this was only $28! Thanks, Sierra! You know I love pops of color! This dress is so pretty and looks great on you! I love how you styled it with pops of color! Thanks so much!!! It makes me feel pretty when I wear it! So cute! I love she in, they have the best stuff for such a great price! The pink shoes look adorable with it too! Thanks, Missy! ANd they really do! The dress is beautiful and very versatile! You can wear it to so many different events! So true! And I love how it looks more expensive than it is! I love this dress! 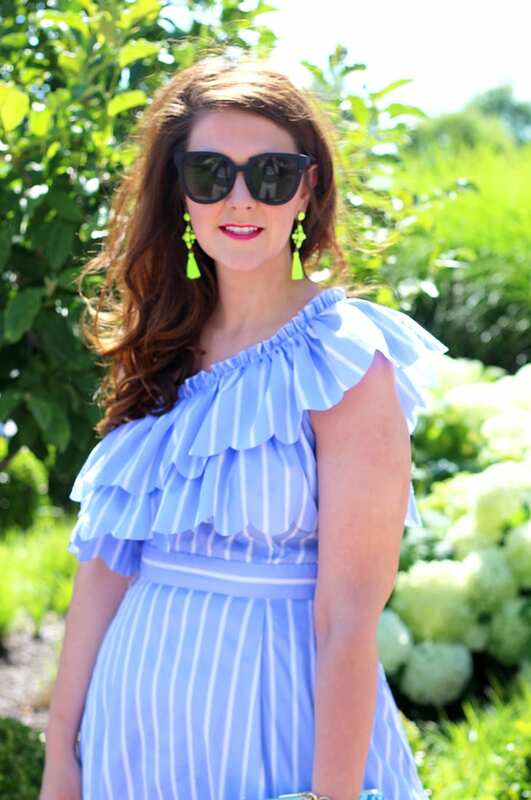 The longer length is different for summer and it’s so cute with the ruffled one shoulder! Also pairing it with those pink heels is a great pop of color! Thanks, friend!!! The length is perfect! This dress is fabulous! So cute on you! Love this dress! So pretty and perfect for the summer. Sharing on my Friday Love this week! Thanks, Sarah!!! I appreciate it! You are stunning Tif!! I adore this dress and you wear it so well! The bright pops are so you and so perfect! Thanks, friend!!! You know I love bright colors! Tiff you look amazing in this dress! The pop of colors are perfect! Thanks, Mandy!!! It’s so fun to wear! LOVE those shoes. I know they’re not new, but I love them in every outfit! Thanks so much, Jacquie!!! These heels are a summer staple! That dress is beautiful, specially for that price!! Anything stripes I love specially in the summer time. That dress is so versatile and I think the price is reasonable! 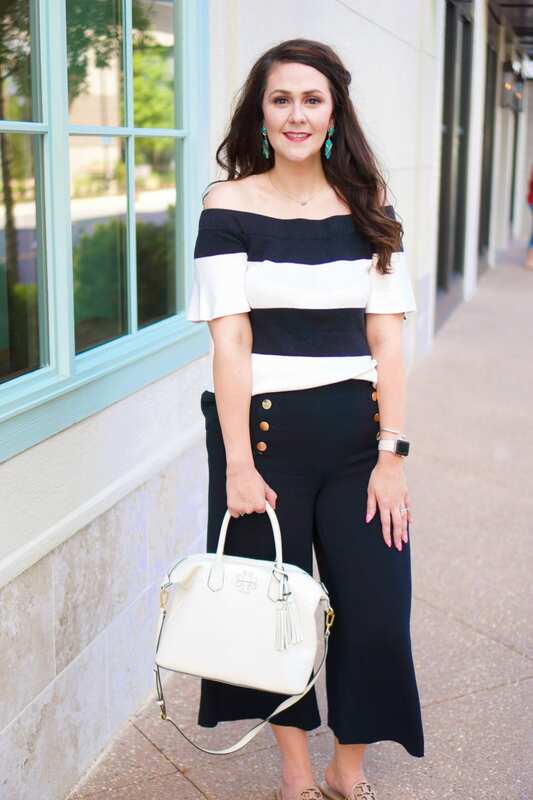 This dress looks so good on you & I love that you paired it with this clutch! I would literally wear this dress any and everywhere because #bluestripegirlgang y’know? One shoulder and pinstripes? I’m in! Plus, I can’t believe how affordable that dress is!! I think the ruffle dress looks amazing with those pretty pink shoes! Oh wow, this dress is absolutely beautiful!!! Love the combo of that blue dress and pink heels. Amazing. I love your dress! 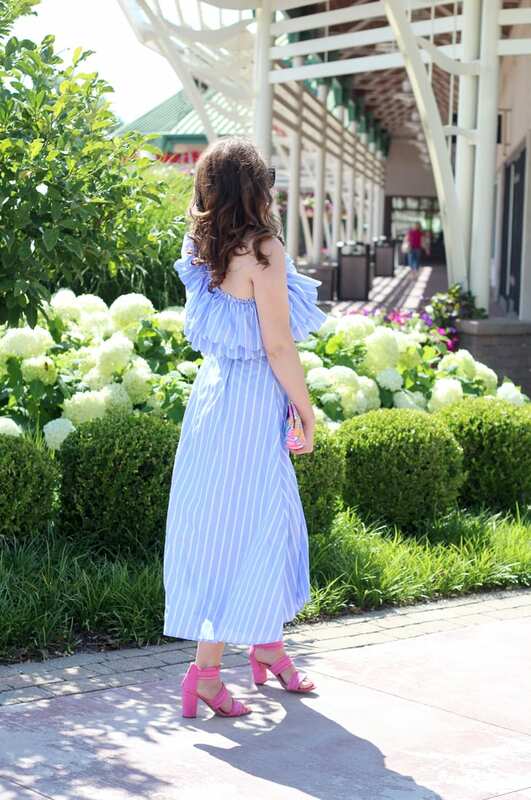 The one shoulder ruffle style is so pretty and it looks fab with the pink sandals and neon earrings!